Wide range of square shower drains for tiled floor. 3 sizes and 6 grating patterns (one of them is tile in shower drain). Suitable with standard-thickness tiles. Included waste trap provides 26 l/min throughput and 20 mm water seal. Completely waterproof minimalistic shower drainage. It consits of 100 x 100 mm drain frame and 94 x 94 mm slot grate. It has included Pure drain type, which is tile able one. Channel should be filled with 94 x 94 mm tile, so at the end of the day only gaps between the cover and rest of the floor should be visible. Stainless steel is finished with brush, which is very practical and long lasting solution, even after scratching it damage will usually not be visible. Square shower drain Wiper Top Breva cover and frame is made of stainless steel and waste pipe and plastic non-return valve McAlpine siphon trap and pipe. Dedicated non-vowen fabric sealing membrane and stainless steel collar with screws is included, for easier installation. Total height of the drain is 143 mm. It can be cut to decrease size and minimum height is 97 mm. 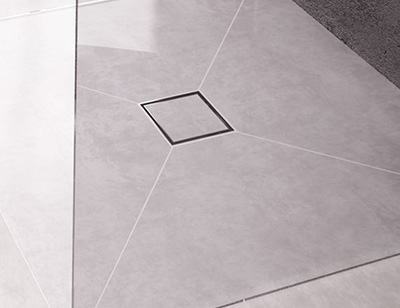 Drain comes with included Breva grate, which has a pattern of regularly placed rectangles next to squares. It is unique style among our other drains. Insulating flange radius is 100 mm. Stainless steel is finished with brush, which is very practical and long lasting solution, even after scratching it damage will usually not be visible. McAlpine siphon trap comes with the drain. It is dry trap, which means that it will stop the smells from returning back to shower even after water evaporates. It's flow rate is 32 l / min which is more than enough for standard shower, which requires only 24 l /min. Siphon outlet can be connected to 40 and 50 mm waste pipes. Square shower drain Wiper Top Zonda cover and frame is made of stainless steel and waste pipe and plastic non-return valve McAlpine siphon trap and pipe. Dedicated non-vowen fabric sealing membrane and stainless steel collar with screws is included, for easier installation. Total height of the drain is 143 mm. It can be cut to decrease size and minimum height is 97 mm. Zonda grating is patterned with angled rectangles over the entire cover surface, ends of them are rounded and they allow water to flow. Insulating flange radius is 100 mm. Stainless steel is finished with brush, which is very practical and long lasting solution, even after scratching it damage will usually not be visible. Appropriate McAlpine siphon trap comes with the drain. It is dry trap, which means that it will stop the smells from returning back to shower even after water evaporates. It has throughput of 32 l / min which is more than enough for standard shower, which requires only 24 l /min. Siphon outlet can be connected to 40 and 50 mm waste pipes. It consits of 100 x 100 mm drain frame and 94 x 94 mm grate. Zonda grating is patterned with angled rectangles over the entire cover surface, ends of them are rounded and they allow water to flow. Stainless steel is finished with brush, which is very practical and long lasting solution, even after scratching it damage will usually not be visible. It consits of 120 x 120 mm drain frame and 114 x 114 mm slot grate. It has included Pure drain type, which is tile able one. Channel should be filled with 114 x 114 mm tile, so at the end of the day only gaps between the cover and rest of the floor should be visible. Stainless steel is finished with brush, which is very practical and long lasting solution, even after scratching it damage will usually not be visible. Chat started. Session ID: 1556251060. You are now connected to: David M.